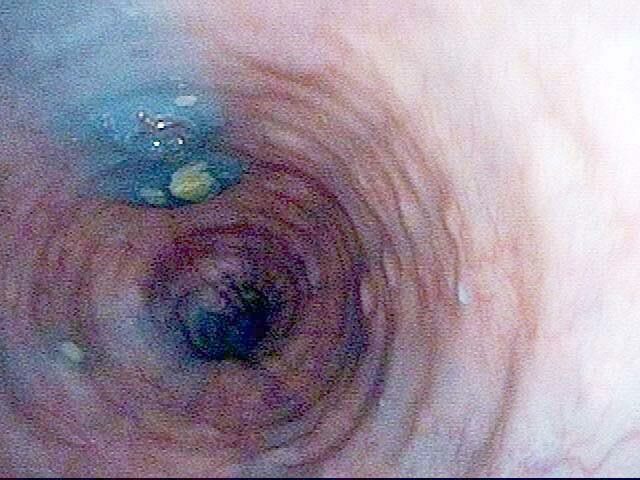 After patient swallows blue-stained applesauce, some enters the trachea. 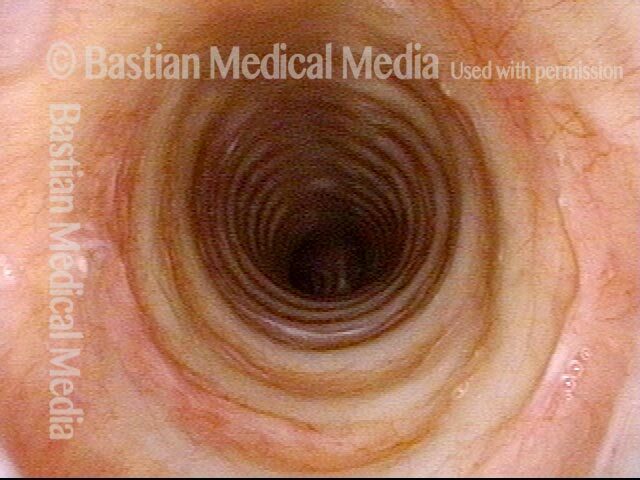 Vigorous coughing can clear this away so that even chronic aspiration of this sort does not necessarily cause pneumonia. The patient aspirates a drip of saliva. If this were a larger amount of food material, and if it frequently descended much lower, to the level of the air sacs, this person would develop pneumonia. 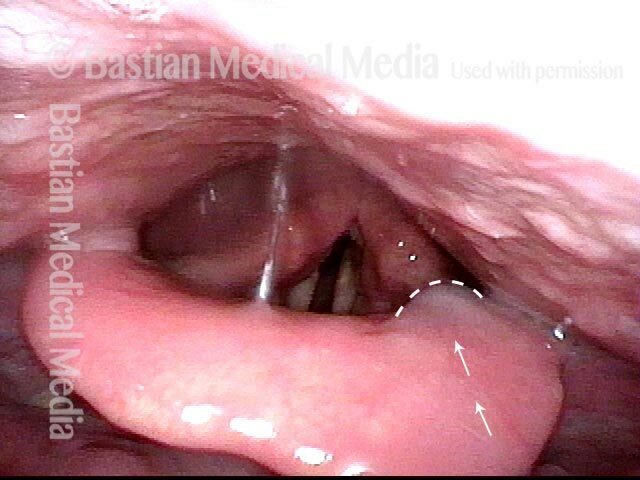 Panoramic laryngopharynx view. The patient is holding a sip of liquid in his mouth and preparing to swallow it. Before he initiates the swallow, a small drip of liquid "escapes" and drips downward into the pharynx. The patient does not yet suspect this. There are only a few drops of liquid, even though it looks like a larger amount due to the close-up view. A few milliseconds later yet, the tiny drip has fallen halfway down the length of the pharynx. One can see that the patient is not aware of this drip, as he has not fully closed the vocal cords. 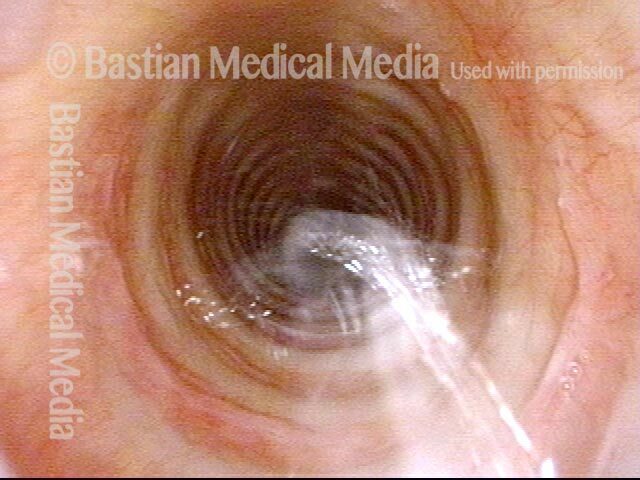 A few milliseconds later, the drop is arriving at the left (right of image) pyriform sinus. The patient is still not aware of this swallowing "mistake". The vocal cords remain open, so if this liquid had dripped instead into the laryngeal opening, it would have entered the airway and made him cough. With a second sip of faintly blue-stained water, a small trickle escapes "early" before the swallow. 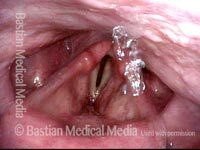 One can see the leading edge of water flowing onto the epiglottis (indicated by the dotted line). The leading edge of the water has advanced and continues to flow downwards. This is indicated by the dotted line and arrows. The leading edge of the water has again advanced and continues to flow downwards into the laryngeal vestibule and through the open vocal cords. This time, the patient coughs.